James Milner, New Zealand Tree Grower November 2006. The arrival of new eucalypt pests in New Zealand has caused many farm foresters to abandon species which have proved to be particularly vulnerable, including eastern blue gums such as E. saligna and E. botryoides. 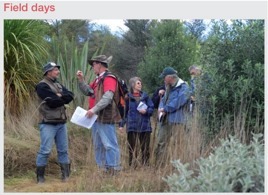 A trial established in 1995 and located on Tuapaka, Massey University’s hill country farm south of the Manawatu Gorge, compares the performance of 12 eucalypt species on different hill country sites, focussing on sites with different aspects. An important element is to record the damage to different species from various pests and diseases. So far we can conclude that the eastern blue gums have suffered much more from pests than other species, particularly stringybarks. Possums have caused considerable damage, as has the Ophelimus leaf gall wasp, one of the recent arrivals. Possum browsing is a routine problem for farm foresters. Typical damage includes defoliation and broken leaders which can often result in poor form. Possums were controlled by poisoning during the establishment period but no additional control was undertaken. Significant possum damage became evident three years after planting and increased in subsequent years. Most damage occurred over the winter months and more damage was sustained on the sunny aspect than the shady. Possums are just as keen as the rest of us to stay warm and dry. Generally the larger trees were preferred, particularly on the sunny face. This was probably because the better trees had higher foliage nutrient concentrations, particularly nitrogen, making them more palatable. Eucalypt foliage with low nitrogen can contain high concentrations of tannins and other toxins which deter feeding by herbivores. Possum damage affects tree form. 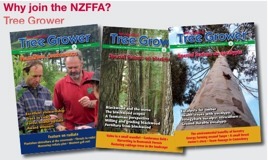 Plots at Tuapaka with a high proportion of browsed trees had poor form. Common faults resulting from possum damage included kinks and multiple leaders. Possum browsing in the eastern blue gums at Tuapaka resulted in poor form in many of the largest trees. Ophelimus leaf gall was first detected near Wellington in the late 1980s and is now widespread. Galls result from wasps laying single eggs in young leaves, typically in rows. After hatching the larvae aid the formation of galls which provide protection as they progress through their growth stages. Infested leaves are likely to age prematurely and be shed from the tree, reducing photosynthesis, growth and vigour. The first leaf galls at Tuapaka were noticed a few months after planting. At five years of age, 68% of E. botryoides and 55% of E. saligna were infested, but there were no microsite differences. Moderate to heavy leaf gall infestation was associated with reduced diameter growth. In both species, trees with moderate to heavy infestation had significantly lower diameter at breast height at five years than trees without galls. There was no difference in diameter at breast height between trees free of gall and those lightly infested. It is difficult to be certain that gall infestation alone reduced diameter at five years because trees suffering from leaf gall were more likely to suffer from possum browsing at that age, particularly those on the sunny face. Possums and Ophelimus appeared to favour the same trees. Other pests which target the eastern blue gums, such as the brown lace lerp have also appeared at Tuapaka and have contributed to the poor vigour and form of these species. Overall, the level of damage to these species has been such as to relegate them to the not recommended category at Tuapaka on both sunny and shady sites.